Find your fit with GrizGo! 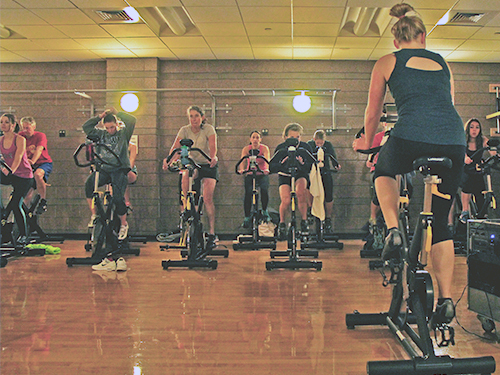 Available to the University of Montana campus community, this service offers fitness classes tailored to your group at a time and location that works for you. You can come to the Fitness & Recreation Center, or we can bring the fitness class to you. Our pop-up fitness classes allow you to stay healthy and active at your convenience. Do you want to offer your conference attendees the chance to loosen up with some yoga? Do you and your residence hall floormates want to have an OULA dance party? How about challenging your group with High-Intensity Circuits, bonding over trying Pilates mat for the first time or learning all about proper lifting technique from a personal trainer? Our pop-up classes cover all this and more! One of our instructors will teach a private class for your group right here in the Fitness & Recreation Center. These classes take place in our fitness studios, and a wide variety of exercise equipment is available for your use. We will send a fitness instructor to you so you can work out where you are! We have facilitated yoga at Lewis & Clark Villages, OULA in residence halls and more. Benefit from the knowledge and expertise of a certified personal trainer. If your club, department or organization is interested in requesting a fitness class, please fill out the form below two weeks prior to the event. If you have any questions or concerns, feel free to call Fitness Programs at 406-243-2833 or email campusrec@mso.umt.edu.